My friend Lacy, from Play, Discover, Learn; has been making products that are meant to be an easy entrance into the world of Cuisenaire Rods and Gattegno. I purchased one of her packets from her TPT site, she gave me the rest, then I decided to review them. This is my attempt at a disclosure statement. You'll notice that there's no advertising on this site and when I review things it's because someone asked me to or because it is something I use and want to share. Which means, I paid for it. Lacy did not ask be to review her work. When I look at materials for supplementing Gattegno, I want to know if the materials either a) simplify Gattegno or b) bring something new to the table. There is a ton of good stuff out there, but you can't use it all. I want to avoid redundancy and clutter. It is a waste of both time and money. But I'm not a purist either. I don't think you must do Gattegno only and exactly as he prescribes or your kids won't get into college. I'm a huge Gattegno fan, obviously. Any movement in that direction will not only make your kids better students but also make you a better parent. Better to apply the principles imperfectly than not an all. Ideally, then, something would be useful if it helped a parent overcome the mental hurdles to just getting started with Gattegno. That is how I am evaluating Lacy's materials. I don't think her stuff is a stand alone curriculum yet. But she is whipping out stuff like nobody's business and much of it is very good. I didn't realize until I added the link that Lacy has most of the pages she gave me together in a Play, Discover, Learn math notebooking bundle, which is how I would purchase them. Lacy has attempted to take Gattegno's material and create 'out of the box' ready materials to use with your kids. For the most part, she is accomplishing what she set out to do. For the activities themselves, she provides ample instructions. The task cards extend the activities and I can see how it will take some of the anxiety away from a parent who is 'just getting started'. Lacy indicated that was her desired goal with the materials. We pasted the pages into our interactive math notebook. One of the nice things about the notebook is that the pages are stored away and aren't part of these random sheets lying about. That kind of stuff irritates me. The other thing about keeping an interactive math notebook is that Dad can easily ask P. what the pages are about and P. can relate all the things we do with one particular page. Lacy's pages make our notebooks much more attractive. I'm not a crafty, cutesy kind of girl so our notebooking pages are pretty boring except when I paste in games. 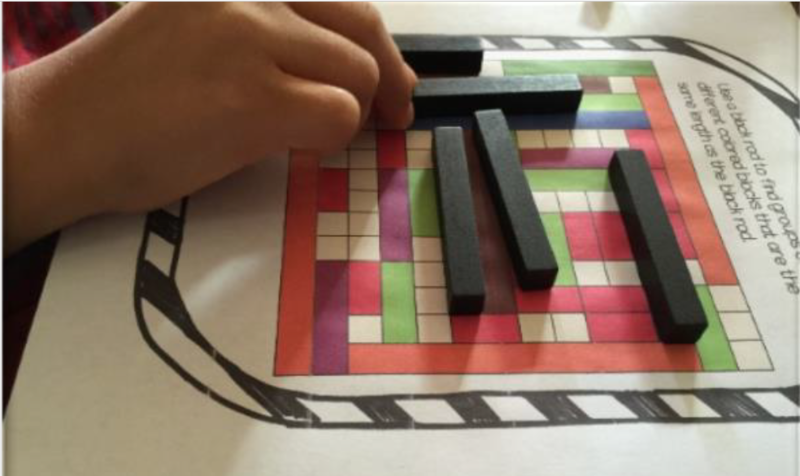 Our favorite Play, Discover, Learn activity is the Search and Finds for Cuisenaire Rods. These activities are easily extendable to add a wide variety of math situations. Our current favorite is taking turns placing a rod on the search and find mat.Player one places the first rod and then must write or dictate and an equivalent statement from the search and find. Player two must place a rod on the game mat so that it touches player one's rod. The game continues until the board is covered. With each successive turn, the rods must touch a rod already in placed on the mat. You can cross over parts of rods and you will have to at some point. When this happens the player is forced to come up with a statement that reflects the rods and parts of rods covered on the game mat. Discovery Page: this page is for writing discoveries. We don't use that page. We keep a separate notebook for that kind of thing. Activity Pages: Each packet has a different number of activity pages to glue into your math notebook. Task Cards: Each activity has 4 task cards that extend the activity page. Instructions for both the activity pages and the task cards with helpful hints and ideas about extending the materials even further. 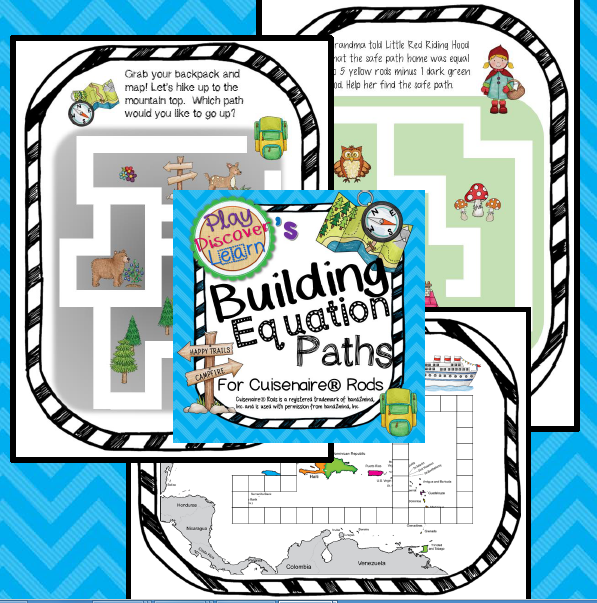 The bundle contains work with fractions, staircases, playmats, odd and even, lock and key game for subtraction, and equations. Materials are very user-friendly. She makes the activities progressively more difficult so they build on one another. Task cards are probably the most brilliant part of the packets. Each activity also has 4 additional task cards that include how to use the same activity for addition, subtraction, multiplication, and fractions. This is very helpful to the parent who isn't sure how to cross-teach concepts. The task cards don't contain everything because they can't. What I expect would happen is that over a time a parent would learn 'to see the math' and be able to further extend the activities without the help of the task cards. She has tried to stay true to Gattegno. While the materials aren't perfect, they can help you overcome your mental blocks and just get started. Which is exactly what Lacy was aiming to accomplish. I think she's achieved that part. The pages are visually appealing to kids. Again, I'm not a cutesy kind of girl, but P. will continue to play with certain pages long after math lessons are over. So my opinion is not that important. If we want to use these as an intro to Gattegno, it would be good to make a note to where you can find similar content in Gattegno's work. This is purely personal as the activities themselves are stand alone. While there are notes and hints in the instructions on how to extend the activities (beyond the task cards), there isn't enough instruction to help a parent with a weak math background. I'm not sure it's Lacy responsibility to provide everything in the packet. But this does limit the use of the material for certain people. I know how much work goes into something like this and Lacy can't include it all. Part of the problem with Gattegno is too much at once. Lacy has broken this down into chewable amounts of information, if she puts in more it might defeat the whole purpose of simplifying. How to remedy this, I'm not sure. Perhaps this is an opportunity to make more products or something like level 2 task cards or blog posts on how to get the most out of her products. This really only effects parents with students above the k/1 age range. There isn't enough focus on good questions to ask the student or how we know what questions to ask. This is a limitation of the Gattegno textbooks as well. My recommendation is that you read Goutard and take the BBL training listed above under conference. One of the greatest limitations is the size of the paper. Because the length on the page fixed, the kind of work the child can do is automatically constrained. This isn't anything that can be remedied, but teachers or parents seeking to use these materials need to keep this in the back of their mind and seek to extend the work by adding more rods and using the activity pages as a guide. The last and most serious issue with the materials is that there isn't a way to know when to move ahead and make the task harder or even know that you probably shouldn't do an entire packet in a week. Lacy can actually teach her kids. I am not a good teacher by nature. I'm an information-shover-inner. So if Lacy mentions factoring, in my former days I would have started with factoring and not even considered my child can't do that yet. Some may laugh at that, but I've met enough parents like me that I know it's an issue. Gattegno has a path to follow in his books. There isn't one with these materials. This goes back to wishing the material was connected to Gattegno's work or there were level 2 task cards which could be purchased as an add-on or blog posts for explaining how to use the material. If you are going to use these, I would at least read my posts on the first few chapters of Gattegno's book 1 so that you can see the progression. Or, you can hound Lacy to do a webinar so that you understand some of the basics. I suspect the material will be most useful for those who want to implement Cuisenaire Rods but aren't sure how to get started or are paralyzed by how much you think you need to know to get started. Lacy's material is a great way to get your feet wet. The pages are attractive and set out for the parent. There is very little prep required. I would still do the activity myself before presenting it to my child. Or make a math notebook of your own and work on the activities alongside your student. You will learn a lot and you'll be able to pull a lot more out of the activity than if Lacy wrote 100 task cards. Another place I see these as valuable is someone who has a curriculum they love but also sees the value of Cuisenaire. These activities will be excellent to use for deeper exploration of the concepts covered in a standard curriculum. They are also useful as a supplemental material for parents who are already using the rods effectively. That's how we use our interactive math notebook. If I don't have a plan then I can just grab the book and we can look for an activity. Sometimes P. asks to use something out of the notebook and sometimes life happens and I need something to just get me through math today. I can easily go to our math notebook and choose one of the Play, Discover, Learn activities or something else we've put in there. That has rescued me more than once.